Comfort food at its most homely. 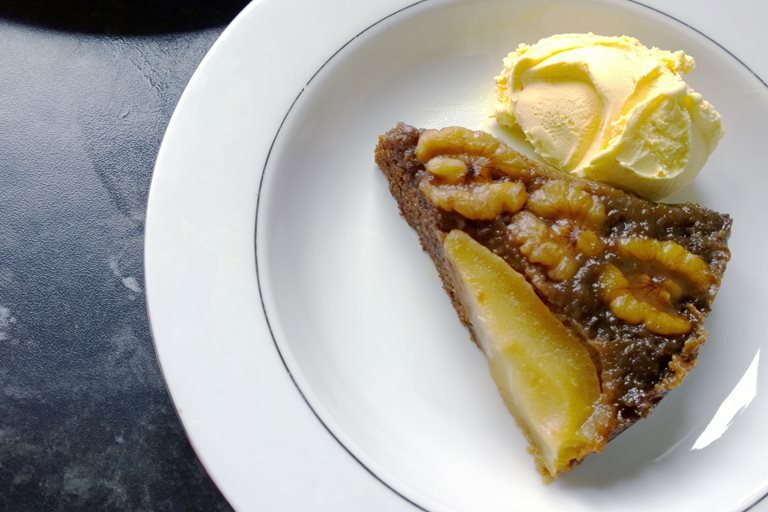 A lovely gooey cake, spiced with ginger, laced with sweet pear and crunchy walnuts. In my opinion, the secret of a successful dish isn’t necessarily dependant on how it was cooked, or who cooked it, or whatever ingredients it contains. A plate of saffron-infused lobster, dressed with a Yubari melon salsa and stuffed with truffles, caviar and wagyu would probably, if not definitely, taste like a dog’s dinner. Not even Remy the rat, the world’s greatest chef (from the film Ratatouille) could deliver on that promise. No, the simpler litmus test for a plate of food is how it affects ambient levels of sound during the eating. If the table falls from a crescendo of yelps and chatter and becomes deathly silent, barring the odd scrape of a fork and knife, then you know you’ve nailed it. That’s how it works in my family anyway. And sometimes it comes as a sweet relief to discover a dish that actively encourages quietude. 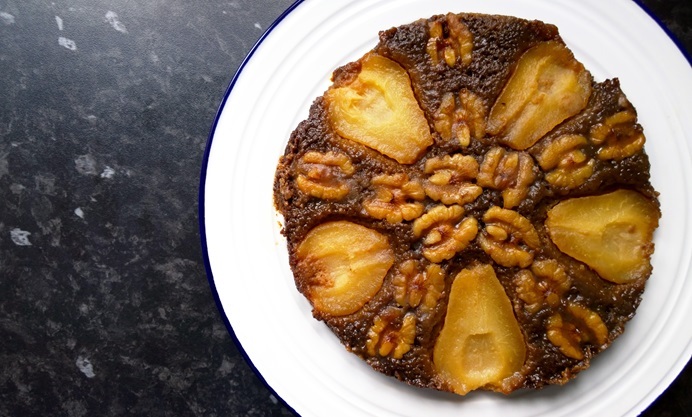 Such as this lovely gooey cake, spiced with ginger, laced with sweet pear and crunchy walnuts. I’ve cooked this cake plenty of times now but the biggest impact it ever had was on two gentlemen who come in the shape of my father-in-law and an uncle-in-law. Both builders by trade, they don’t necessarily talk but more like shout all the time, especially at each other and before serving, the noise levels they were creating very nearly threatened to burst our collective eardrums. Yet when I plonked down the flat, fat slices in front of them (with a healthy dollop of ice-cream alongside) well, you could have heard a pin drop. Of course the peace didn’t last long. It never does when they come over, but the point is, any dessert that can shut up these two up, even just for a minute or two, that is the ultimate testimony to its greatness.